Welcome to the worst episode of Your New Opinion yet. Join in as the boys discuss the merits of eating meat vs the good and the bad of being a vegetarian. Nick renounces all things beefy to defend vegetarians while Ryan hates on hippies and tells us why meat is best. Can Ryan convince Mike of what he already knows? Can Nick convince himself of something he doesn't? Can the boys carry a show without dumb-dumb Grant there to chime in? (Spoiler they can't). 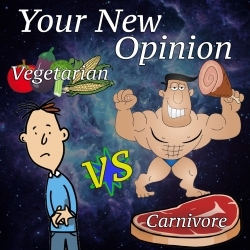 It's Meat Eating Vs Vegetarianism!